that I have been working on over the past year. 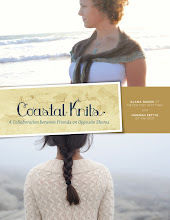 This is a sequel to Botanical Knits published last year. 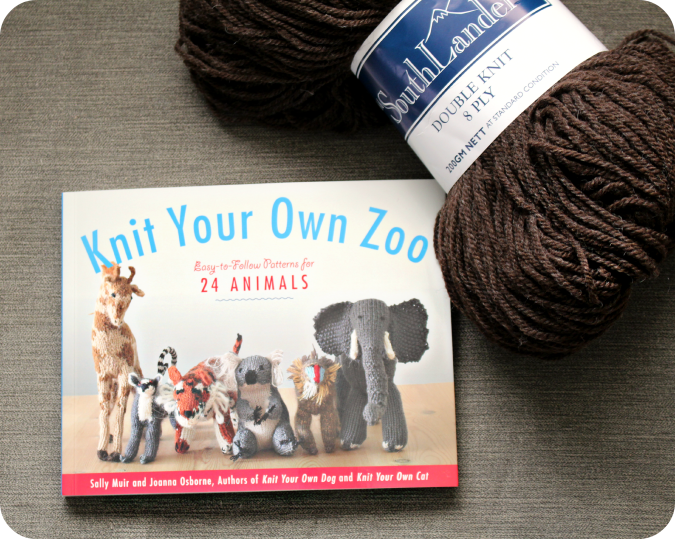 The response to that book was so positive and I just wasn't quite ready to stop designing botanically inspired knits quite yet. Here is a little peek at the 12 new designs. This sweater was the first piece I designed for the collection and I think it might be my favorite. I love the romantic over-sized hood that forms a beautiful shawl collar in the front when worn down. There is also a tree motif on the back. I call it a "secret" tree because it is only visible when the hood is up. This sweater also has A-line shaping, a pretty rounded back hemline and a few little gathers where the skirt meets the bodice. This beret is a fun and fast project to knit. The lacy stitch pattern is a perfect one for beginning lace knitters because it isn't very complicated. I would consider this design to be the easiest hat in the collection to execute. Unlike the others, you won't have to get out your cable needle for this one! Thicket is worked from the brim up and can easily be finished in only a few evenings. I love love love the way this shawl turned out. 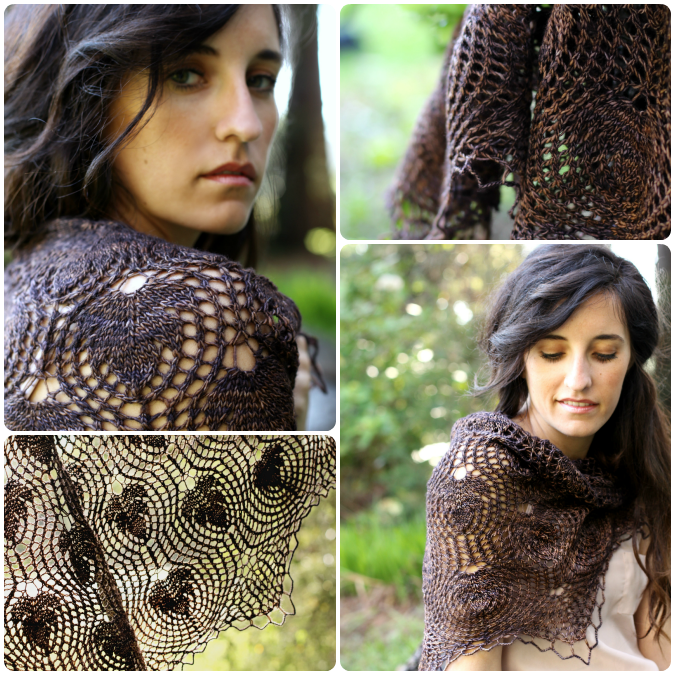 The body of the shawl is basic, but the edging is what makes it truly unique. 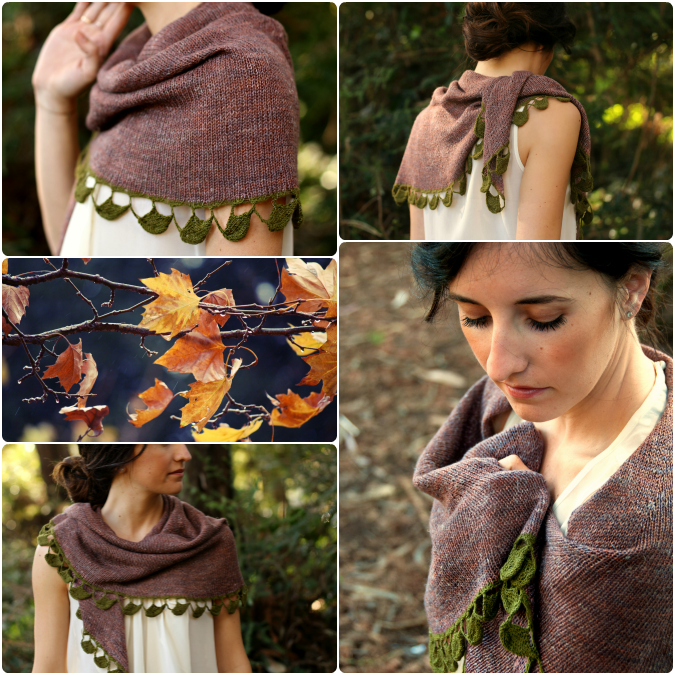 My goal was to create a leafy edging that was barely holding onto the body of the shawl like spent leaves clinging to branches at the end of the season. With a lot of swatching, I felt like I was finally able to create in knitting what I had envisioned in my mind and I the finished shawl is unusual and whimsical. I'm very happy with this one. 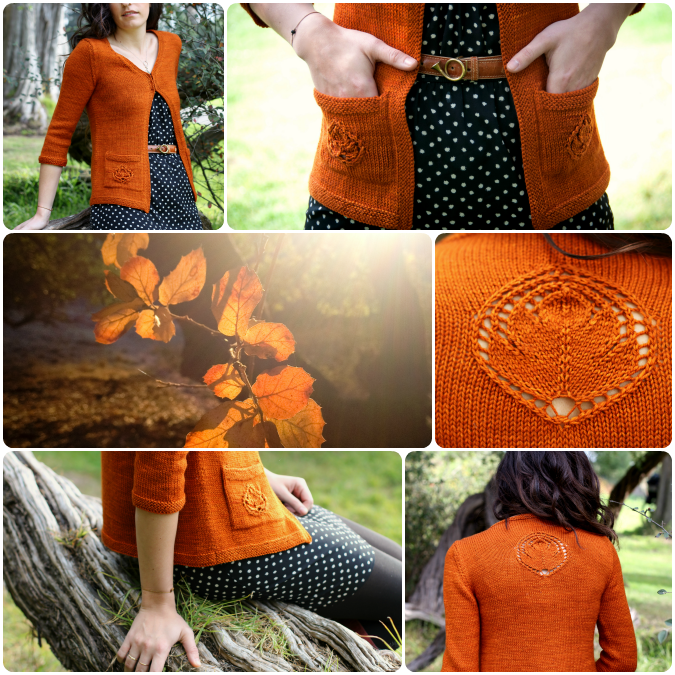 For my Sunlit Autumn cardigan, I wanted to experiment with lace insets. I have often seen this design element used in ready to wear garments and I find it really pretty and feminine. The lace inset on the back reminds me of a photo used in the first book of an autumn leaf held up to the light with sunshine glowing all around it. I wanted to capture that same idea in the stitch pattern and I think it turned out really nicely. 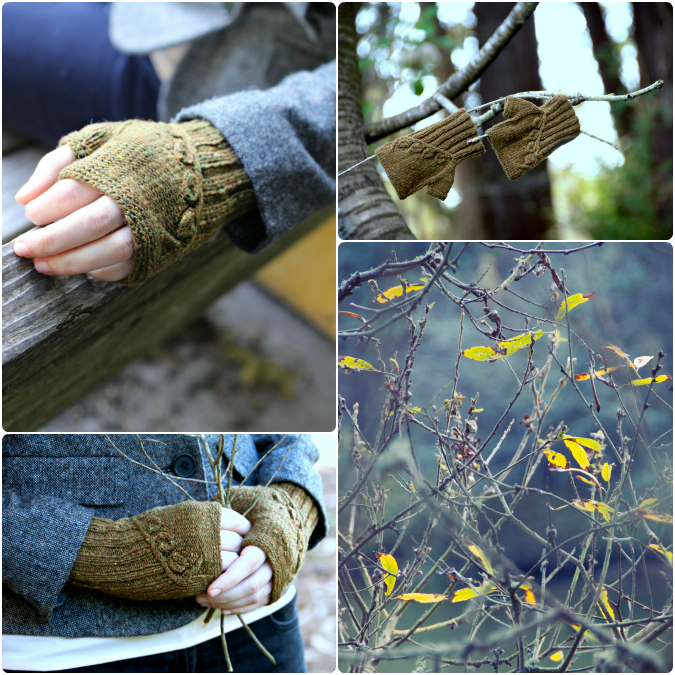 I really loved the stitch pattern that I designed for the Twigs and Willows cardigan from Botanical Knits and decided to create a smaller version for these cute cropped little mitts. These are a perfect choice for those of you who are interested in trying out this stitch pattern but are not quite ready to commit to an entire sweater project. The shawl itself, however, is so pretty. It is made up of solid knit autumn leaves floating in a sea of lace stitches. When I hold the shawl up to the light it reminds me of sunlight streaming in through the leaves of a tree. 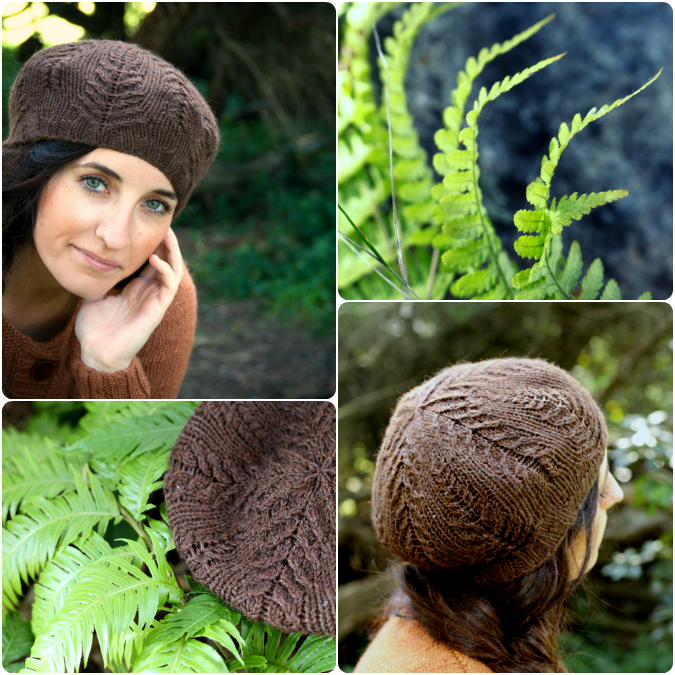 The Ivy Trellis Hat was originally released as a special pattern giveaway to everyone who pre-ordered Botanical Knits, and it is now appearing in my new book. 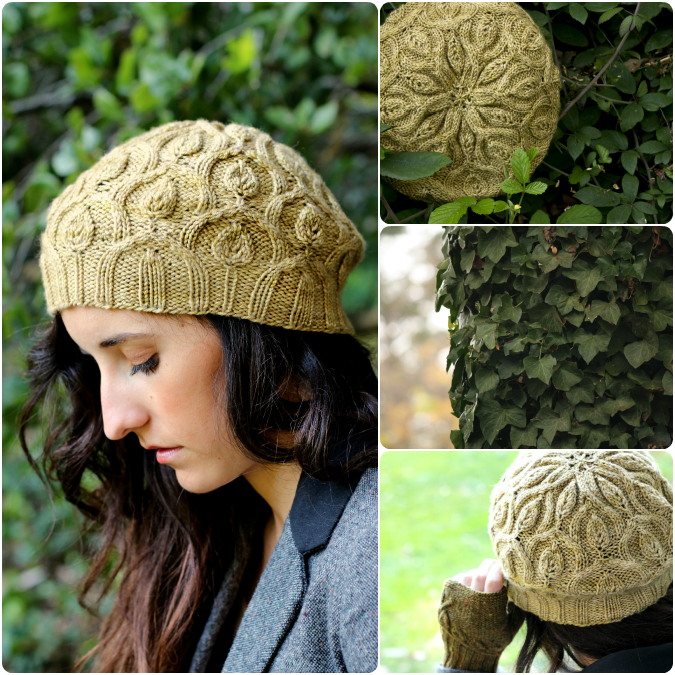 This hat is designed to coordinate with the Ivy Trellis Socks and Mittens from Botanical Knits. Between you and me.. I cannot get enough of this stitch pattern. I think it is so beautiful and it translated so well into a hat. I love the embossed texture of the cables and leaves. 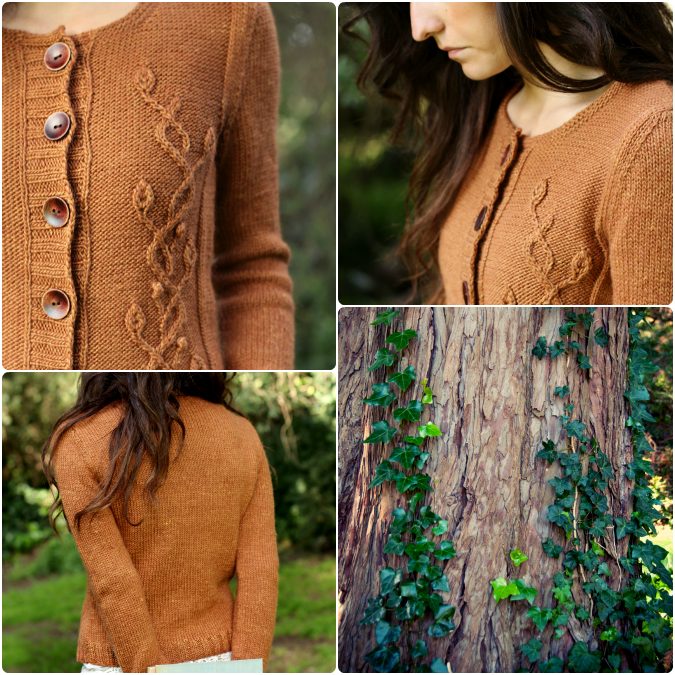 On this cardigan, a textured, flourishing vine climbs up the left sweater front, much like a vine on a tree. It's a striking detail that is so fun to knit. 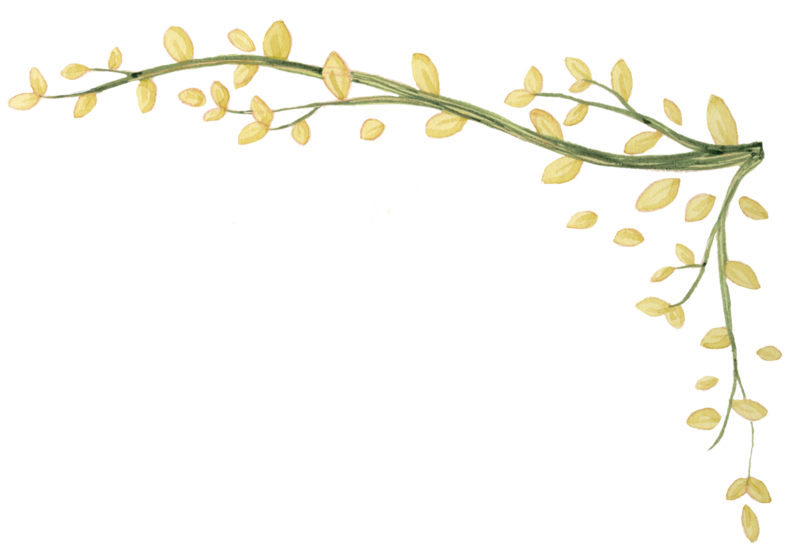 I love designs like this with a single plant motif. They are so addicting and go so fast because you can watch the plant grow on your needles as you work. Waist shaping has been incorporated to the sides of this cardigan for a flattering fit. 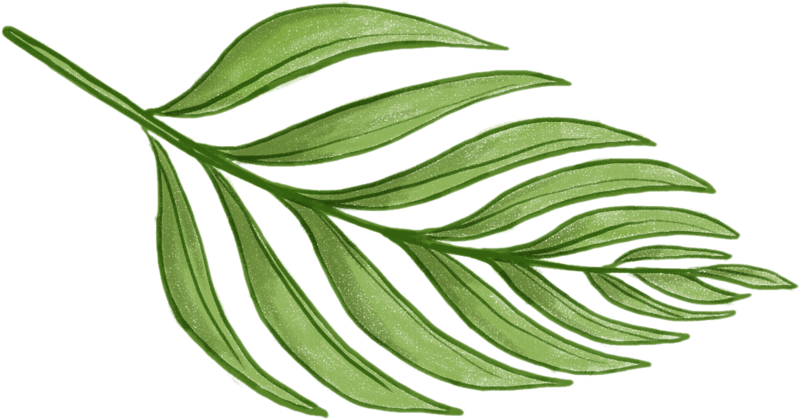 With this design, I experimented with working a new leaf shape into the stitches. 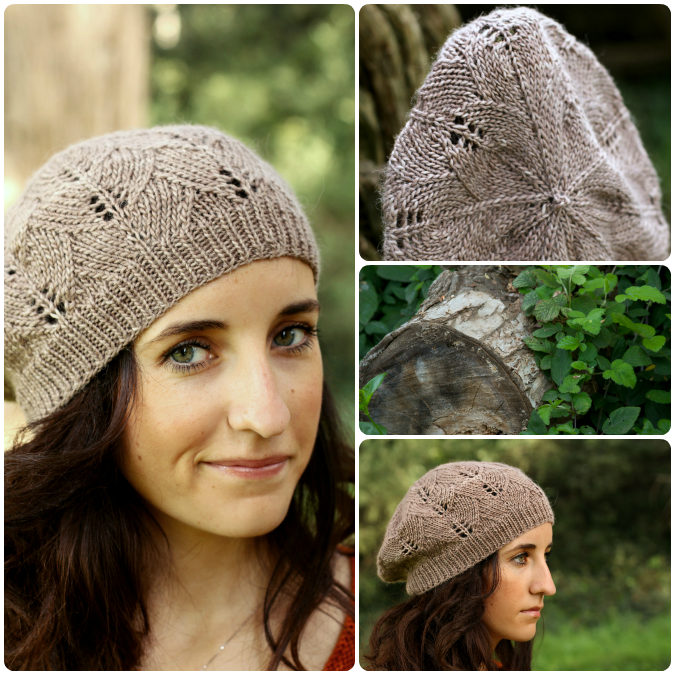 The result is a slouchy hat with subtle fern stitch motifs growing out from the crown as well as the brim. I think that this pattern could definitely be a unisex pattern and sized up for a man. Verdure was originally available for a limited time as part of the Twisted Yarn Shop Mad About Tosh Club 2013 and is now appearing again in Botanical Knits 2. 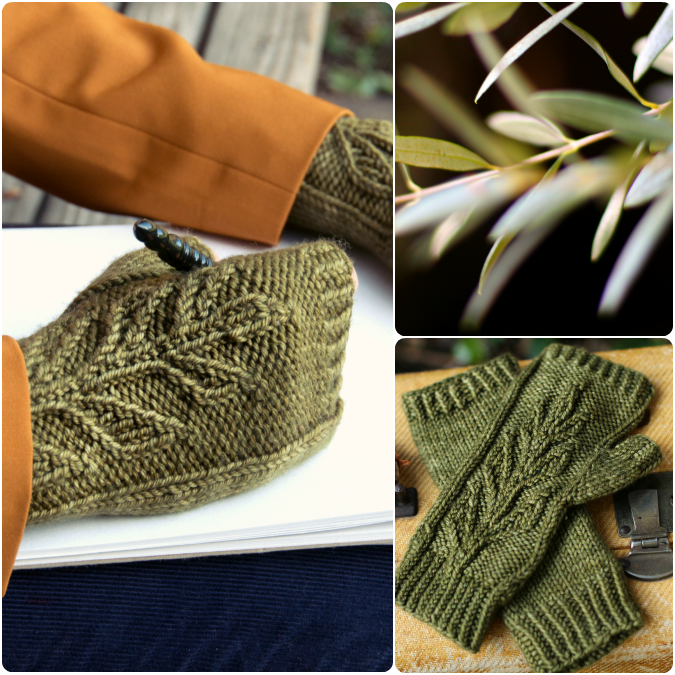 These mitts feature a fun twisted stitch sprouting plant motif on the back of the hand and only take one skein of Madelinetosh Tosh dk. They work up very quickly! You may remember my blog post about this design a few months back. 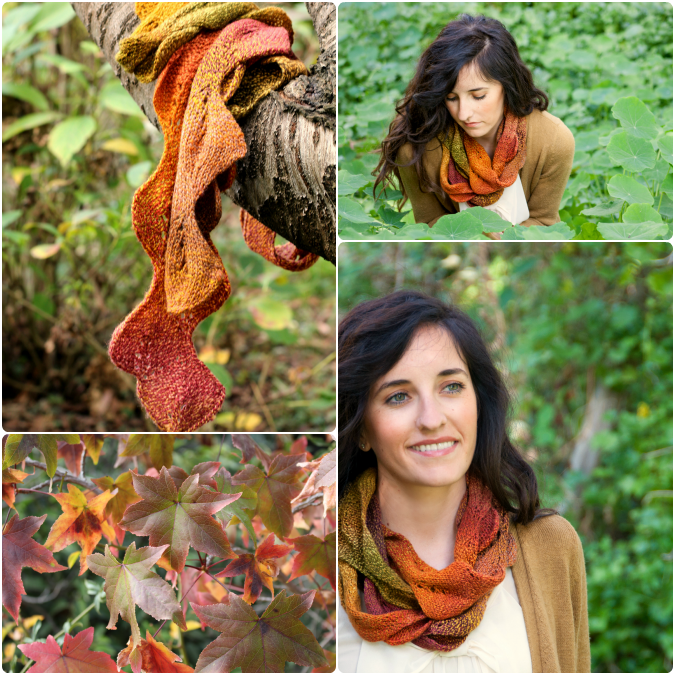 The colorway this scarf is made from was especially created just for this project. 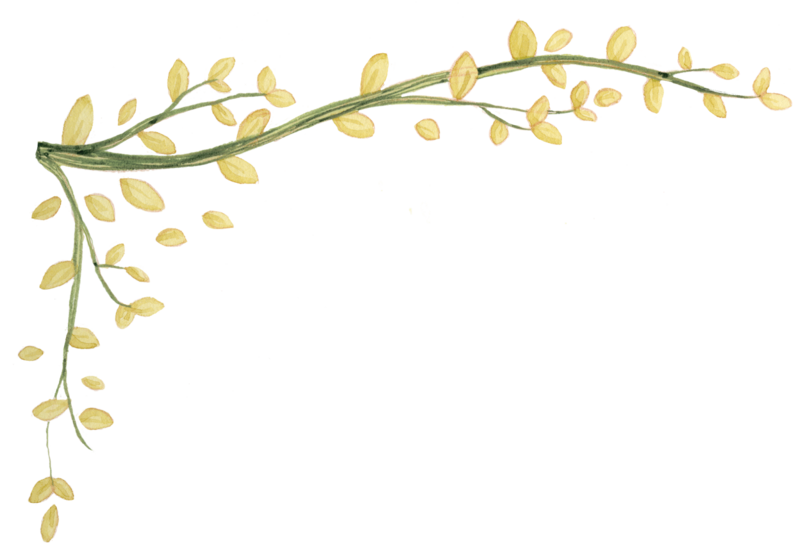 The gradient colors represent the spring-to-autumn life cycle. The scarf is a long decorative string of leaves that can be wrapped around your neck several times for a cozy colorful scarf. Now this sweater you have seen before. Sprig was released previously and has become quite popular due to it's unique details and construction. The special thing about this sweater is the asymmetrical neckline that once completed results in a symmetrical sweater. A leafy sprig of foliage wraps around the neckline and sleeve cuffs and I love the way that the little leaves drape over the shoulder when worn. It is a special sweater. Unlike any other sweater pattern, I've seen! I hope that you all really enjoy these new patterns as much as I did designing them! Do you have a favorite? Let me know in the comments below! Botanical Knits 2; Twelve More Inspired Designs To Knit And Love will be available digitally and to pre-order in print from our website (botanicalknits.com) on March 3 at 10:00 am PST. Please join our email list below to receive an email when the book is ready to order. For now all of the pattern pictures and information is up on Ravelry! Please check them out HERE. I have also added discussion/KAL threads for each design on the Botanical Knits Ravelry group forums. Please join us as we discuss yarn options and plans to begin the new projects. I will be checking it to answer any questions you may have about the new designs. Also please be sure to tune in to my next podcast episode where I will be sharing even more about each of these patterns. 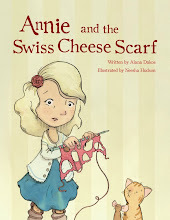 Thank you so much for your patience, support and excitement for my new book! Hello friends. 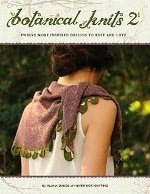 I am planning on releasing Botanical Knits 2 in e-book format and for pre-order in print in the next couple of weeks. 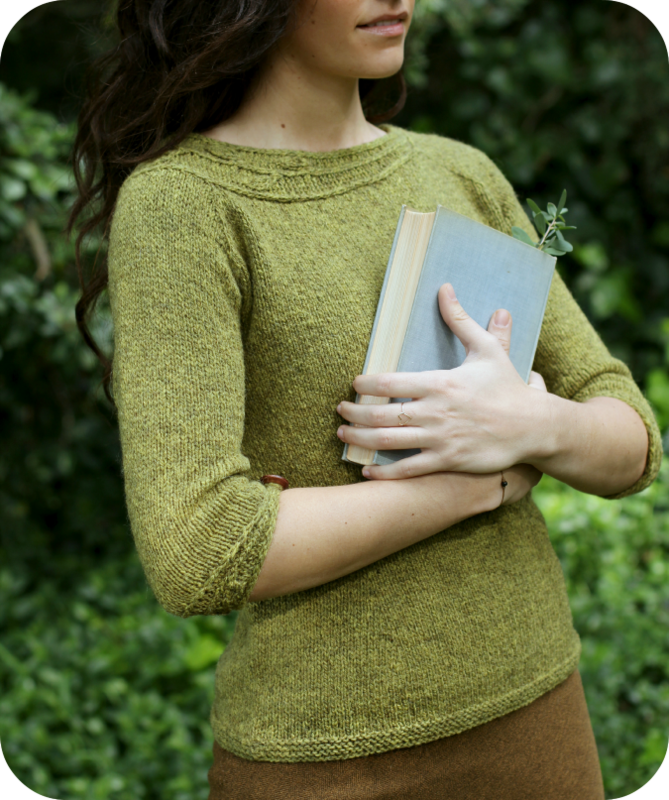 Because of this, I will be taking down my Sprig sweater pattern on February 20th. 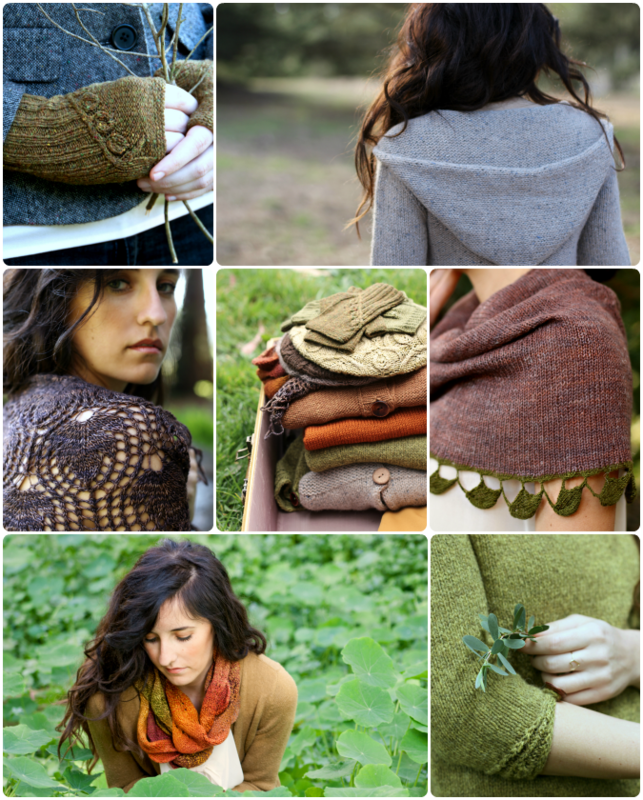 Sprig will be included in the new book, but this is your last chance to purchase the pattern individually. 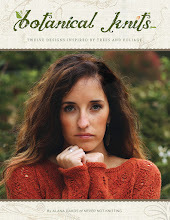 Remember that if you choose to purchase Botanical Knits 2 the entire cost of the Sprig pattern pdf will be applied to your purchase of the book. Please keep your Paypal receipt email containing your Transaction ID or Receipt No. code. Either of these codes will allow you to receive a $6 discount on your copy of Botanical Knits 2! 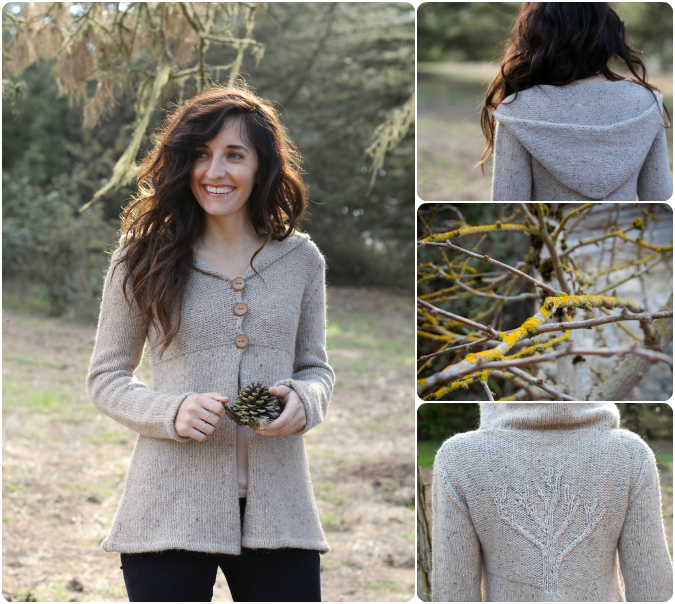 I am so pleased with the positive response that this sweater design has already received on Ravelry. There are already so many beautiful finished sweaters to look at. I love seeing the different color and yarn variations! 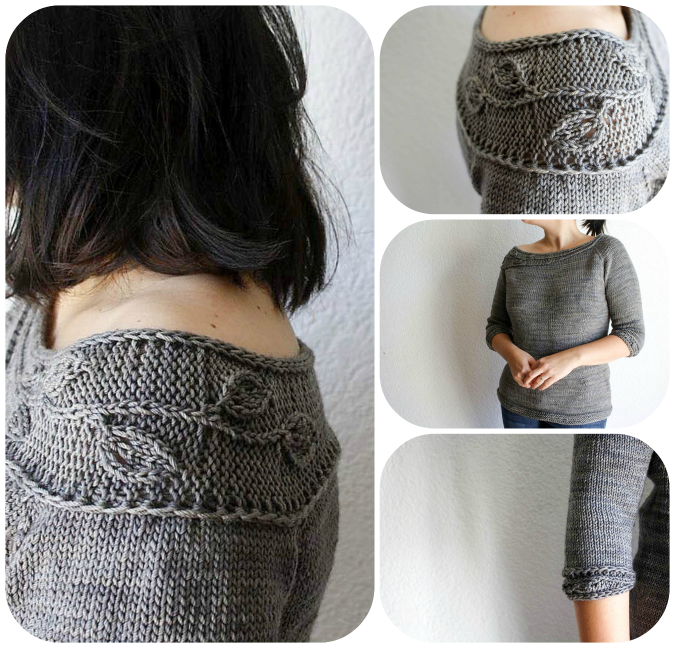 One of the first Sprig sweaters to pop up was this lovely gray version by ittybitty on Ravelry, and it is still one of my favorites. Check out all of the other fabulous projects HERE. 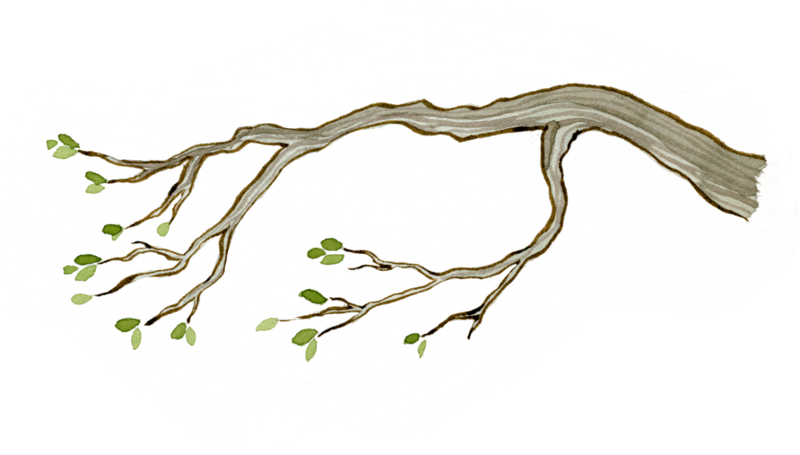 Click HERE to purchase the individual Sprig pattern pdf. Last weekend we shot the photos for my upcoming book at the Golden Gate Park in San Francisco. What a perfect location. Lush, green, and gorgeous! Seeing the finished photos makes me even more excited for this book release, and I thought I'd share a little sneak peek with all of you. I can't wait until it is all finished! :) Hopefully soon!